When people are involved in a traffic crash, or victimized by thieves, or suffer property damage, very often they need to obtain a copy of the police report. The copy may be needed for insurance purposes, for legal purposes or litigation, or for proof that the incident was reported. Whatever the reason, it is very simple to get a copy of a police report. The Records Clerk works Monday through Friday, 9:00 am to 5:00 pm. To request a copy of a report, you can telephone the Clerk at (252) 332-5012, you can write a letter, or you can stop by the Ahoskie Police Department to pick up a copy. To process your request, the Clerk will need some information from you. The Clerk will need to know the date of the report, and the name of at least one person involved in the report. The Clerk will locate your report, and copy it for you. There is a no fee for a copy of a criminal investigative report, however those requesting a report by mail must send a self addressed, stamped envelope. If coming to the police department, the entire process from the time you walk in the door to the time you leave with your copy, only takes 10-15 minutes. However, if you are requesting a copy of a report older than 3 years, it will take longer. Records older than 3 years are kept in a storage facility. There is a $5.00 fee for Accident Reports. Insurance agents and individuals requesting an accident report must enclose a check or money order in the amount of $5.00 with their request. It takes about 24 hours to process a report, from the time the officer takes it. In other words, if an officer takes your report on Monday, it should be ready for you to get a copy on Tuesday. However if the officers have more than the average reports to complete, this process may take longer. Please excuse us for any delays as we work hard to complete our daily tasks. You can send the self addressed, stamped envelope (and check or money order for $5.00 if your request is for an accident report) by mail to Ahoskie Police Department, C/O Records Division, PO Box 767 Ahoskie, NC 27910 and we will mail the copy of the police report to the address you specify. As you can see, it is a very simple process to get a copy of a police report. 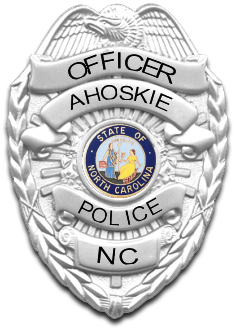 If you have any questions please call the Ahoskie Police Department at (252) 332-5012, Monday – Friday, 9:00 am to 5:00 pm.